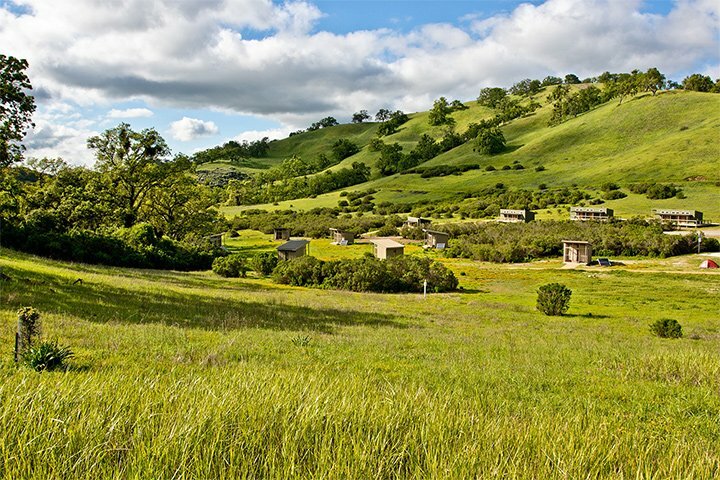 Blue Oak Ranch Reserve sprawls across the steep slopes of Mount Hamilton just east of urban San Jose. Located on the western slopes of the Diablo Range, the reserve falls within the watershed of San Francisco Bay. Approximately two-thirds of the reserve is drained by tributaries of Arroyo Aguague, which flows into southern San Francisco Bay via Penitencia and Coyote Creeks. The bowl-shaped Arroyo Aguague catchment area is characterized by steep wooded slopes and meadows, as well as open flats dotted with oaks and coyote brush. The precipitous Arroyo Hondo is heavily wooded on north- and east-facing slopes, while western and southern exposures consist of open grassland or dense chaparral patches. Streams on the ranch support healthy stands of riparian vegetation in addition to aquatic species. They are important habitat for migratory birds and may be migratory corridors for numerous aquatic and terrestrial animal species. At least 73 vascular plant families are found at at the reserve, almost 80 percent of which are native. Most of the reserve is categorized as part of the Upper Sonoran Life Zone. Plant communities include blue oak woodland, valley oak woodland, black oak woodland, coast live oak woodland, riparian forest, chamise chaparral, Diablan sage scrub, nonnative annual grassland, wildflower field, and native perennial grassland. Four of these are threatened plant communities: valley oak woodlands, blue oak woodlands, wildflower field, and native perennial grasslands. Blue and valley oak woodlands have become quite rare in California, and few are as protected from grazing and the encroachment of suburban development as those at Blue Oak Ranch. Foothill pines occur only in the Arroyo Hondo and on the slopes above its confluence with North Creek. Chaparral patches occur on many south-facing and some west-facing slopes. Grasslands are mainly dominated by exotic annuals, but some native perennial grasses are present. Blue Oak Ranch Reserve habitats support at least 130 species of birds, approximately 41 species of mammals, 7 species of amphibians, more 14 species of reptiles, 7 species of fish, and hundreds of species of invertebrates. Reserve streams and 17 ponds are Sensitive Aquatic Resource Areas habitats that support most of the reserve’s rare species. River otter, California tiger salamander, foothill yellow-legged frog, and red-legged frog can all be found along reserve waterways. Riparian areas are utilized by more than ten species of neotropical migratory birds, including flycatchers, warblers, and vireos. The reserve’s extensive visitor facilities include a classroom, laboratory, barn multi-purpose room, office space, indoor housing for up to 52 people, and a communal kitchen. Santa Clara County, 11.2 miles east of downtown San Jose. Reserve offers day use or overnight camping at this time. A network of roads gives access to most areas within the property. Additional visitor facilities are under construction. The reserve bibliography includes citations of journal articles, books, theses, art, and other works published about or based on activities conducted at the reserve. ArcGIS data library; airborne and satellite imagery for Mt. Hamilton Range; Google Earth KML for boundary and local features; species lists (vertebrates and plants); bibliography; climate records for Mt. Hamilton and City of San Jose. On-site weather station in operation since August 2008; two microclimate sensor networks will be in place by March 2009. Resident reserve director and reserve steward; campus-based faculty reserve manager.